A 20-year-old male received minor injuries after he crashed his car into a light pole on 19th Avenue and Junipero Serra Boulevard this evening, according to a San Francisco Police Department (SFPD) officer. While attempting to make a slight right, the driver of the black Lexus crashed his car when heading to work Monday, according to SFPD officer Tad Yamacuchi. According to paramedics, the man received slight injuries to the left side of his ribs. 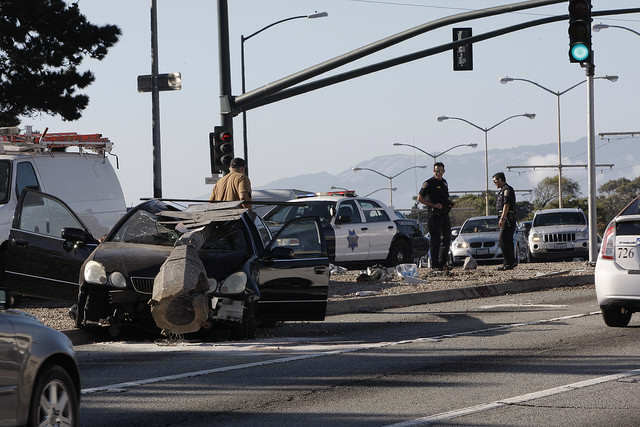 Police officers survey the site of a car accident south of the 19th Avenue and Junipero Serra Boulevard intersection on Monday, Sept. 15, 2014. According to Officer Tad Yamacuchi of the San Francisco Police Department, a 20 year old male, driving the black Lexus, ran into a city light pole on his way to work, when he did not make the slight right. Daniel Porter / Xpress.